Personalized Photo Wall Hanging Tapestry in three sizes. 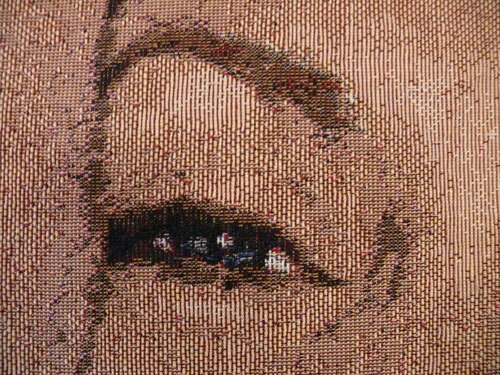 This Photo Tapestry is made from a woven tapestry which provides stunning detail in the final product. After the tapestry is woven, we sew it to a cloth backing and add cloth hanging loops. Add your own personalized touch to the tapestries elegance by using one of many styles of decorator rods that are available. 36" x 26", 53" x 40" or a stunning 60" x 48"
Tapestries can be done in either a landscape or portrait format. They can also be produced as either a full color tapestry like your photo or as a black & white tapestry. Detail that is Woven In! Each tapestry is woven specially for you in our US Based Factory. It is made from a Soft 100% Cotton Yarn. 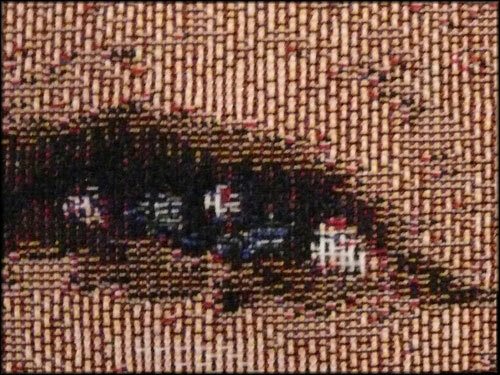 The image is not printed on but is actually woven into a tapesrty. Tapestries will not fade or loose their color even after repeated washings. BlanketsWe recommend dry cleaning the tapestries. are machine washable. We recommend cold water and tumble drying on the lowest setting. This product is great for all ages, both young and old. Any photo will work - black & white or color. But keep in mind, the better the photo, the better the finished tapestry. A clear (in focus) photo is necessary. 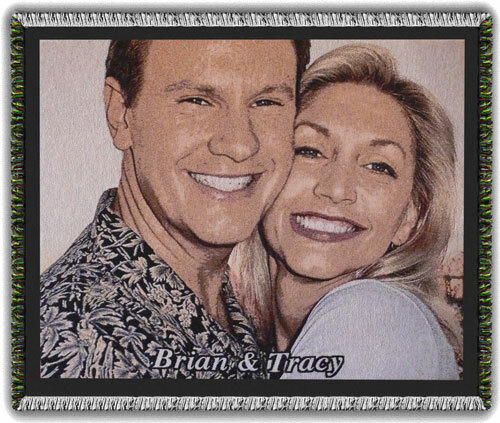 We will notify you if the quality of the photo prohibits making a great quality tapestry. We will compose your photo to fill the tapestry as completely as possible. Usually if your photo is a portrait then the tapestry will be made in a vertical format. If the photo is a landscape, it will be made in a horizontal format. The main subject of the photo should be different in color and contrast then the background of the photo. If the background is a similar color and you still wish to use that photo we would suggest you select the remove background option. For best results one or two people per photo. The more faces in the photo the smaller each face will be on the blanket and the less detail of each face. Please do not send photos with borders, fade-outs, snow effects or shadow effects as they will not duplicate well in the blanket. Possibly. Please upload your photos and we will contact you. Additional fees may apply for the photo layout work. Physical photos of all sizes will be accepted. Send physical photos to Kid Music Personalized Blankets, 1811 Taylor Drive, Gilbert, SC 29054. Please include a copy of your order confirmation which you will receive shortly after completing your order. Normal delivery time is 4 to 6 weeks from when we receive your photos and text. If you mail us a physical photo to scan we can not begin your order until we receive your photos.